One interesting thing about making a point of reading books I’ve had on my To Be Read shelf for a long time is that I end up picking up books that I don’t remember getting. I have them, but I have no idea why. 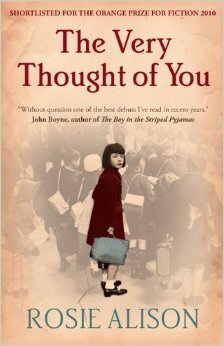 In the case of this novel by Rosie Alison, I imagine I got it when it turned up on the 2010 Orange Prize shortlist. The subject matter, child evacuees during World War II, interests me, and perhaps I saw some reviews of it at that time although I don’t remember hearing anything about it recently. At any rate, because so much time has passed since I got it, it’s almost as if I’m reading it cold. The book begins with the start of World War II, when 8-year-old Anna Sands is preparing to be evacuated with her classmates. The process is organized, yet weirdly chaotic, as the children are moved along with no clear indication of their destination. It’s all down to what line they end up in. Anna, hoping for the seaside, avoids the line that gets off the train at Leicester and joins the line to board a different train, one that ends up at York. There, Anna ends up with a large group of children at Ashton Hall. Thomas and Elizabeth Ashton, a young childless couple, have decided to turn their large home into a school that will house as many evacuees as they can manage. Anna comes to love Ashton Hall, and although she struggles with the social morays of getting along with other children, she becomes a stellar student. But Anna’s story is not the only, or even the main, story Alison tells. As the children find a new, temporary home at Ashton Hall, the Ashton marriage is falling apart. Thomas, wheelchair-bound from polio, has lost the tenuous connection he had with Elizabeth when they first married, and both begin to see potential for love outside their marriage. Meanwhile, Anna’s mother, Roberta, is enjoying her freedom from life as a wife and mother while Anna is in York and her husband Lewis are off at war. In Poland, the diplomat Sir Clifford Norton and his wife Peter are coping with a world under attack. This is a lot of story for a single book, and it doesn’t quite hang together. The events at Ashton Hall get the most attention, and these are the parts of the book that work best. Anna’s experiences in particular are follow a clear and compelling emotional arc, and I liked reading about her, even though there were moments when I wondered if her reactions were a little too mature for her age. I don’t know any 8-year-olds well enough to gauge that. Anna witnesses a few key moments in the fraying of the Ashtons’ marriage, and that interplay worked nicely. Alison puts us in both Thomas and Elizabeth’s heads, so we’re able to understand both perspectives, but reader sympathies are directed more toward Thomas. I wish she’d spent more time in Elizabeth’s head as the story developed, but she disappears from the narrative for long stretches, so it’s harder to care about her increasing discontent and its attendant self-destructiveness. It’s too bad about the book’s lack of focus because I liked parts of it very much. Alison’s descriptions of Ashton Hall and of wartime London and Warsaw have just the right amount of detail. It’s nice writing that doesn’t show off. If the plotting had held to the same standard, this would be quite a good book. But as it is, it’s merely OK.
What an interesting review! I always wonder when I read books like this that seem to have really two different stories going on if the author was simply struggling for material and afraid to say, split the narrative into two separate books (not a series, just two different stories). I also think children are tricky, and child protagonists who seem too mature are a common problem. She had a couple of good book ideas in here and room to expand any of them into its own separate novel. I’d much rather have had two or three shorter novels than one that tries to pack in too much. It sounds a bit Lady Chatterley in the middle with crippled husband and wandering wife. I suspect I’d be more interested in learning more about the child evacuations – it must have been enormously traumatising for so many of those involved, and we often only see the more humorous side of ‘fish out of water’ in fiction. Maybe I should read Lady Chatterley. That part seemed like it could be a good story, if better developed. The child evacuations were what interested me most, and she handles it in a serious way, which is nice. I was really interested in what happened after, when Anna went back home to a father she barely knew. Take out the other stuff and build that part up, and this could have been great. My mother and father were both “children of the blitz”–evacuated from London at the beginning of the war. My mother and her siblings were taken in by a farm couple who grew very close to the entire family; in fact, my grandmother had a baby during the war and named her for the woman who’d taken in the children. My father’s experience was less happy–he was at an evacuees camp for the duration. He never talks about his wartime experiences. Wow! That’s fascinating. I had no idea there were camps. I was amazed when reading this at how disorganized the process was, with no clear destination for the children as they boarded. And that chaotic process could lead children to entirely different experiences. It is kind of fun sometimes to read a book you have forgotten why you picked it up. I also find it entertaining to find a book on my Kindle and just start reading it, even though I have forgotten what the plot is even about. I think that computer prompt could help a lot of authors. I have read some books that go on some completely unrelated tangents and I lose interest in the book. One thing I find nice is that if someone recommended it, I’ve forgotten and figure the recommender has, too, so no one has to feel bad. I had this out from the library a while ago and started it but didn’t finish it. I felt the same as you — that there was too much going on, and the author didn’t have all of it under good control. Once I realized it wasn’t working for me, I was close enough to the end that I figured I may as well finish–and I liked parts of it quite a bit, but it doesn’t hang together as a whole. Those stories of evacuation seem so extreme to me. I have trouble imagining what the parents must have felt. My grandmother always said it was the hardest thing she ever had to do in her life: to take her children to the train station, have a numbered placard placed around their necks, and sent off to who knows where–praying that they would end up with good people. I don’t think I’d have the courage (or faith in the government) to do that today. This book has been sitting on my shelf forever. The lack of focus makes me a bit hesitant to read it now, but I’m sure I’ll give it a try at some point. Parts of it were good, so it’s certainly worth trying!